As Hoff observes, "People revealed bits and pieces of their lives, that were only remotely connected to the court appearance." In these vignettes, rich with detail, dialogue, and humor, the reader is treated to an insider's view of the justice system. What our insider reveals are sad, touching, funny, and true tales, told by someone with a big heart and a huge commitment to justice. Agatha discusses her book with Kimberly Chase of Bay Area Bios in the video above (11/06/11). Or ask your local bookstore to order a copy for you. Perfect for law and laugh-lovers alike! Pick one up today! Listen and learn from San Francisco's wisest (and wryest) Court Commissioner. 45th Avenue @ Sloat Blvd. October 21, 20121 at 3:30 P.M.
November 2, 2012 11:50. A.M.
November 6, 2012 10:00 A.M.
Take a peek behind the courthouse curtain with Agatha Hoff 's new book, a captivating account of her years as a San Francisco Court Commissioner. The book's title was taken from graffiti left by a disgruntled litigant on the courthouse bathroom wall, much to the amusement of observers, including Agatha herself. From the recurrent parade of prostitutes she recognized on a first-name basis, to the out-of-towners trying to navigate a day in the city, Agatha captures it all with her keen eye for detail and wry sense of humor. A defendant who had run a flashing red light without stopping pleaded, "But Your Honor, I went through on the blink." Another day, a young couple approached the bench. "This gal and I stood in line so long, signing up for Instant Hearing," the fellow informs me, "we decided to get hitched. Will you marry us, Judge?" He turned to the smiling bride and inquired, "By the way honey, what's your name?" 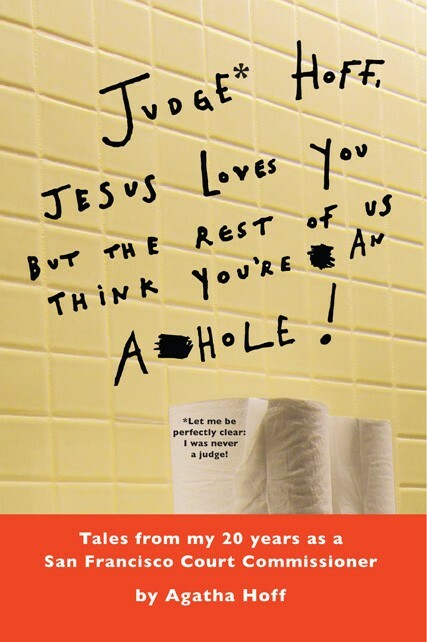 Judge* Hoff, Jesus Loves You but the Rest of Us Think You're an A**hole! is an insider's look at the job Agatha refers to as being, "the grand marshal of an endless parade of the human race." Read Agatha's interview in The Richmond Review.